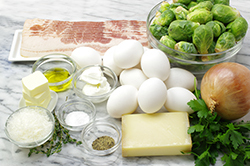 There are so many great obvious food combinations – peas and carrots, peanut butter and jelly, tomatoes and mozzarella, and, of course, Brussels sprouts and bacon. Why fight it if it just works. 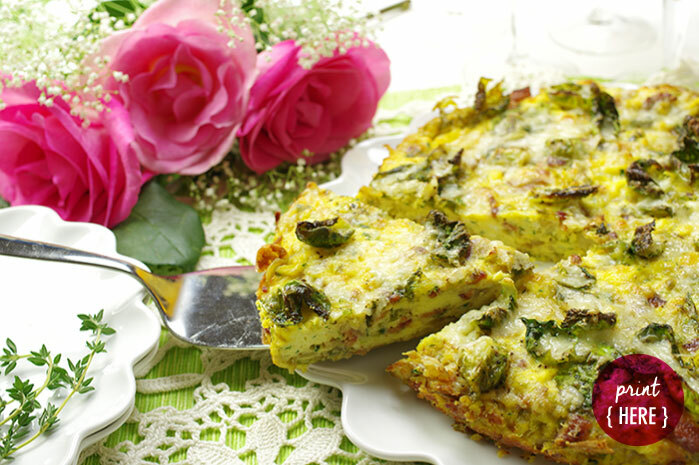 Frittatas are just as good at room temperature as they are hot out of the oven; if you are entertaining, this is an ideal thing to make early so you can attend to other tasks once your guests have arrived. 1. Preheat your oven to 475°F/240°C. 2. 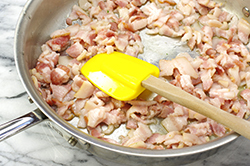 To make the filling; In a large sauté pan over medium-heat, sauté the bacon in 2 tsp of the olive oil and the butter, until browned. 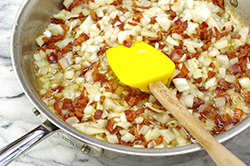 Add the onion, 1/2 tsp of the salt, and the thyme and sauté until soft, about 10 minutes. 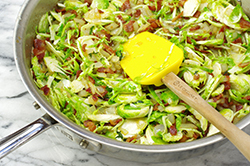 Add the sliced Brussels sprouts and sauté for about 5 minutes longer, until soft. 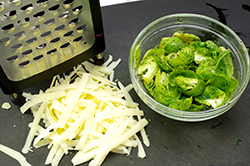 Transfer the vegetable mixture to a bowl and set aside. 3. 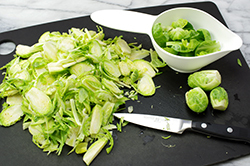 Toss the Brussels sprouts leaves in the remaining 1 tsp olive oil, remaining 1/2 tsp salt, and the pepper. Set aside. 4. 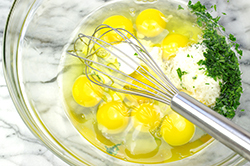 To make the custard: In a mixing bowl, whisk together the eggs, crème fraîche, Parmesan, and parsley. Set aside. 5. In a 10-in/25-cm cast-iron or other ovenproof sauté pan, melt the 2 tbsp butter over medium-high heat. 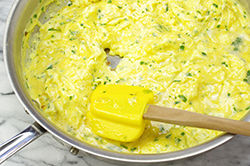 Pour the custard into the pan and stir, lightly scrambling the eggs. Slowly add the vegetable mixture to the custard and continue scrambling. 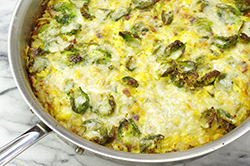 When the eggs are about 30 percent set, sprinkle with the Brussels sprouts leaves, top with the Gruyere, and transfer to the oven for 8 to 10 minutes, until the frittata is cooked through and browned on top. 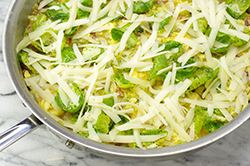 If the frittata doesn’t show signs of browning, place under the broiler for 2 minutes, but watch it like a hawk! 6. 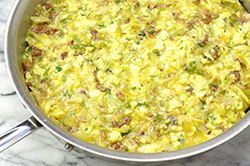 Immediately transfer the frittata to a plate by running a spatula around the edges and underneath to free it from the pan. Serve hot or at room temperature. This keeps well, refrigerated, for up to 3 days. Reprinted with permission from Huckleberry by Zoe Nathan. Copyright 2014. Published by Chronicle Books, San Francisco, CA. All rights reserved.